There is a certain excitement in the return of wildlife every spring. Humans are longing for warm weather and more color on the landscape. Although I am not as enthusiastic as the robins, red-wing blackbirds, and grackles in the morning, their morning songs are welcomed as a sign of better things to come. Every day during this time of year we witness the rebirth of the earth. Frogs and snakes are waking up, a mouse can be seen scurrying under beaten down brown grass, and bird species return, sometimes slowly, sometimes in waves when conditions are right. I am fortunate to be at the nature center during some “off” hours when I get to witness nature in ways I otherwise wouldn’t. Last week after our Girl Scout meeting, we exited to the parking lot to be greeted by about a half dozen woodcocks. They were tucked away in open areas surrounding the parking lot, and making their presence known. Occasionally they would shoot way up in the sky, and slowly spiral down while making a fluttering sound. Once on the ground, they would make a raspy “peent” while starting this process all over again. We were fortunate to be able to witness this secret dance due to the timing of our meeting. What a wonderful opportunity for teaching our youth! The woodcock, or timberdoodle, use this display to attract a mate. On April 18, Woodland Dunes welcomes you to join us to witness this event for yourself. You can contact the Nature Center at 920-793-4007 to register. Later in the week, I pulled into the nature center to see a welcome sight way up high. One osprey has returned to our nesting platform right next to the nature center! We have been seeing a pair of herring gulls hanging out on the platform. They seemed to really enjoy this nesting site, and would likely nest here if the osprey weren’t around. In fact, they were circling the platform while the osprey was there and landed as soon as the osprey left. I am excited to watch how this turf battle plays out. Fortunately, we have a very nice camera which always us to have a “bird’s eye” view of the platform. 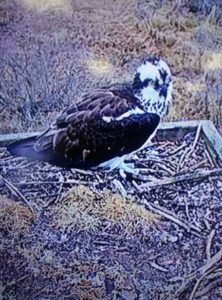 We were gifted funds from a generous donor and fellow bird enthusiast, Steve Lankton, to improve the live stream of our osprey camera and to store video footage on the “cloud” where we can pull off clips for educational purposes. Our live feed now streams through YouTube Live, saving our internet bandwidth here at the nature center. In the past, the camera would use up all of our bandwidth during popular viewing times. We also have cloud storage and the ability to pull video clips, such as hatching, feeding, and fledging, to be able to show during education programs. I hope everyone has a chance to witness nature’s transition from winter to spring, with the promise of summer just around the corner!